Do you find it hard to concentrate in your office with coworkers chatting outside your door? Or do you wish you could play the piano when inspiration strikes at 3 a.m. but are worried you’ll wake the neighbors? If you have not soundproofed your door yet, put it at the top of your soundproofing to-do list. Not sure where to get started? Regardless of whether your door is new, old, wood, metal, interior, exterior, standard size or awkwardly big, Quiet Door™ sweeps and seals can help! What Are Door Seals and Sweeps? Soundproof door seals reduce the air and sound transferred through entrances by lining the perimeter of doors with aluminum and silicone. Door seals are DIY soundproof materials with which you install using household hand tools. All you need to do is a little pre-drilling for attaching soundproof door seals, and then follow the easy instructions included in the package. 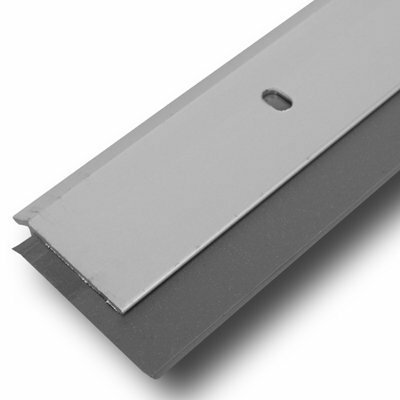 Soundproof door sweeps also use aluminum and silicone, but are installed at the bottom of doors to block sound and air from escaping through the threshold. Enhanced by a long-lasting silicone seal that remains pliable even in cold temperatures, soundproofing door sweeps are great for use in hotels, apartment buildings, recording studios and homes with multiple bedrooms. 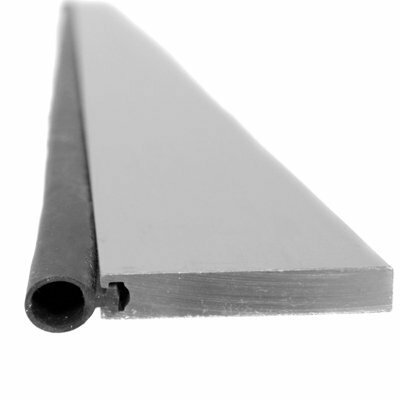 Door sweeps, like acoustic door seals, help keep interior noise in and exterior noise out. Door sweep installation is simple, yet it makes a cow-sized difference when it comes to noise control. Door seals and sweeps can be used separately, but provide the most thorough door soundproofing when used together. As you’ll see, our door seal kits and under door sweeps make the perfect pair. Why Should You Soundproof Your Door? All gaps and cracks in a room need to be sealed as tightly as possible for the best soundproofing. This means you’ll want to soundproof your door to ensure the highest level of soundproofing possible. Also, soundproofing a door is generally a simple fix that makes a big difference. Likewise, a soundproof door will help prevent sound from escaping your music studio, home theater, office or any room you want privacy and freedom to make noise. What Makes a Door Soundproof? Generally, the more mass a door has and the tighter its seals, the better it will be at protecting against noise. Consider the following – a hollow core wood door has a sound transmission class (STC) rating of 17 decibels (dB). Simply said, the higher the STC, the better. If the door takes up 20 percent of the wall, it will reduce a wall with an STC rating of 48 to 24 STC. However, if the hollow core door is replaced with a solid wood door and sealed around the edges and threshold, it will block noise with the added mass and close up gaps. You would then see a reduction to only 33 dB instead. Improved air quality: A sealed door prevents pollen and dust from getting into the room, leading to better air quality. It also helps keep insects out so you can play guitar without having to swat flies away. Lower utility bills: By sealing air leaks, you can potentially save 10 to 20 percent on yearly cooling and heating bills. That’s because, in the winter, door seals and sweeps help keep heat in, and in the summer, they keep heat out. Less humidity: Soundproof doors increase humidity control which helps protect the home from mold and mildew and keep electronics in good shape. Improved comfort: By closing up gaps around the door, you reduce drafts and create consistent room temperatures, making your home or commercial space more comfortable. Ultimately, you’ll save money and enjoy a more comfortable environment by soundproofing your doors wherever you wish. Even the newest doors can’t completely seal perimeters to prevent air and noise from escaping. With Soundproof Cow’s Quiet Door™ sweeps and seals, you can soundproof new doors, old doors, metal doors, wood doors, outside doors and inside doors. Combining silicone and aluminum, Quiet Door™ sweeps and seals significantly reduce the amount of air and sound moving around a door, so you enjoy less noise and greater peace. 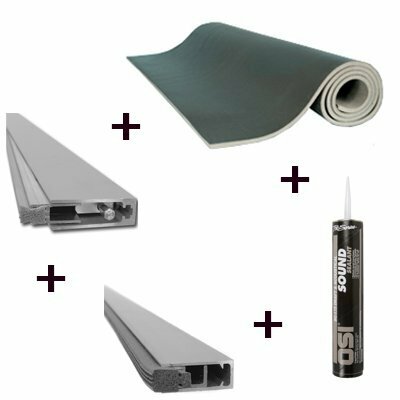 Here’s a list of our door seals, sweeps and kits to help you meet your soundproofing needs. If your door is larger than the standard size, give us a call, and we will make a custom perimeter seal for you. The Quiet Door™ Adjustable Perimeter Seal serves the same purpose as our standard Quiet Door™ Perimeter Seal and is also composed of long-lasting, noise-reducing aluminum and silicone. The only difference between the adjustable perimeter seal and the standard perimeter seal is the presence of adjustable screws. When you turn the screws with a screwdriver after installation, you can push more of the silicone seal out from its aluminum frame. This means that if the seal wears down, you can easily make it like new again. 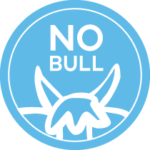 The adjustable perimeter seal is ideal for rooms that get a lot of traffic and where you want maximum soundproofing. The Quiet Door™ Automatic Door Sweep pushes down tight against the door threshold as the door closes. 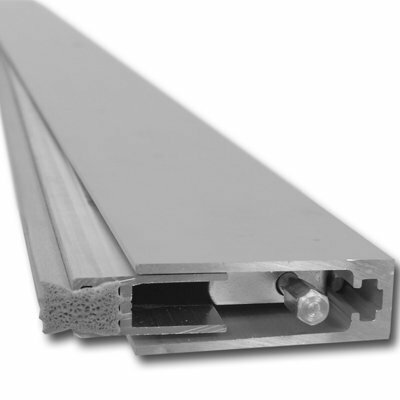 Like the standard door sweep, the Quiet Door Automatic Door Sweep is made of quality aluminum and sound-blocking silicone. However, the adjuster rod allows the seal to rise and fall without the need to manually adjust it. If you wish, you can turn the rod to the right to reduce the drop, and to the left to increase it. As with the standard sweep, you only need to have a drill, drill bits, Phillips screwdriver, tape measure and hacksaw to install the automatic sweep. Both seals ensure longevity so you can spend less time worrying about silence, and more time enjoying it. The Quiet Door™ Commercial Door Soundproofing Kit is designed for commercial and light industrial applications where moderate sound control is needed, and aesthetics are of little importance. For example, if you run a woodworking business, you might consider installing our Quiet Door™ Commercial Soundproofing Kit to prevent noise escaping into the world outside and to keep noise out so you can focus on building masterpieces. It’s easy to install, saving time and labor costs. It’s a cost-effective alternative to replacing doors. The door covering has a Class A flammability rating. 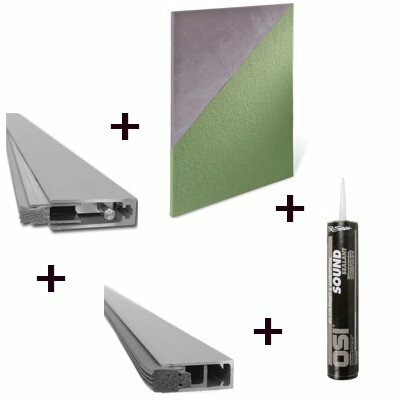 The Quiet Door™ Residential Door Soundproofing Kit is designed to soundproof standard metal doors common in apartments, condominiums and offices with low to moderate noise levels. Rather than including the composite barrier that comes with the Quiet Door™ Commercial Door Soundproofing Kit, this kit comes with a Quiet Door™ Acoustic Panel for soundproofing that is barely noticeable to the eye. The Quiet Door™ Industrial Door Soundproofing Kit is ideal for situations where extreme soundproofing is needed, and aesthetics are not a priority. This kit is our top performer when it comes to door soundproofing, and is great for use in industrial facilities, band practice rooms, gun range facilities and other areas where noise is expected. Just like the other kits, the Quiet Door™ Industrial Door Soundproofing Kit includes the Quiet Door™ Adjustable Perimeter Seal and the Quiet Door™ Automatic Door Sweep. However, what sets this kit apart is the Quiet Barrier™ HD Soundproofing Composite. Quiet Barrier™ HD Soundproofing Composite is a thick barrier and acts as a powerful noise blocker. It’s composed of a 2-pound barrier layer, one inch of sound-absorbing acoustic foam and an easy-to-use PSA backing. This combination of materials blocks sound and absorbs vibrations. The result is highly effective, high-quality soundproofing. If you possess a little construction know-how, a few basic tools and a desire to keep noise away, you should have no trouble installing our door soundproofing systems. We designed our soundproofing products to promote easy installation, so do-it-yourselfers can get back to playing the drums or enjoying a restful nap. Measure the dimensions of the inside of the door frame. Cut the seal to fit the measurements using the hacksaw. Before installing the seal, hold it in place to make sure you have the right fit and adjust if necessary. With the door closed, line the seal up so that the gasket has about 1/32 of an inch compression. Using a number 36 drill bit, drill holes into the door frame for mounting screws. Tighten the screws, being careful not to overtighten them. 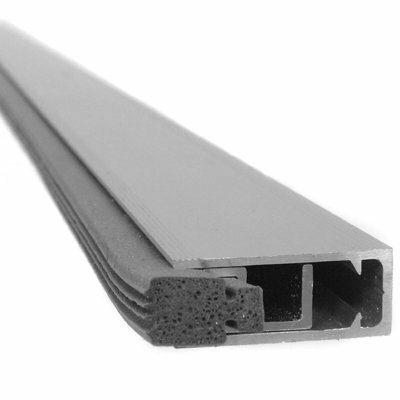 Seal the gap where the perimeter seal meets the door frame using the acoustical sealant. To install the Quiet Door™ Adjustable Perimeter Seal, you will generally follow the same steps, except you’ll want to avoid cutting off all of the adjustment screws. Our soundproofing products come with installation instructions to guide you through the process, and if you run into problems or have any questions along the way, feel free to contact us, and we’ll happily moove you in the right direction. A quiet room is not complete without a soundproof door sweep and acoustic door seal. A soundproof door is necessary to make the most of other soundproofing materials in the room. You’ll produce a satisfying result when you add a soundproof door seal and sweep to your apartment, home, office or band practice space. At Soundproof Cow, we are excited to help you obtain maximum noise reduction, and we’ll work with you until it’s just right. To get started enjoying the delightful sound of silence, purchase a door seal and sweep today! Got questions about whether Quiet Barrier™ soundproof door seals and sweeps are exactly what you need to resolve noise issues? Just give us a call at 1-866-949-9269, and we’ll help you as quickly as possible.